Once the email is created, you need a mailing list for your campaign. Once you have created the content of your email, it's time to determine where that email will be sent. You will need to create a mailing list. Depending on the focus of the email, you can create a specific list of contacts to send to. For example, you may want to only send the campaign to your leads. In order to proceed, you must be in an existing campaign. 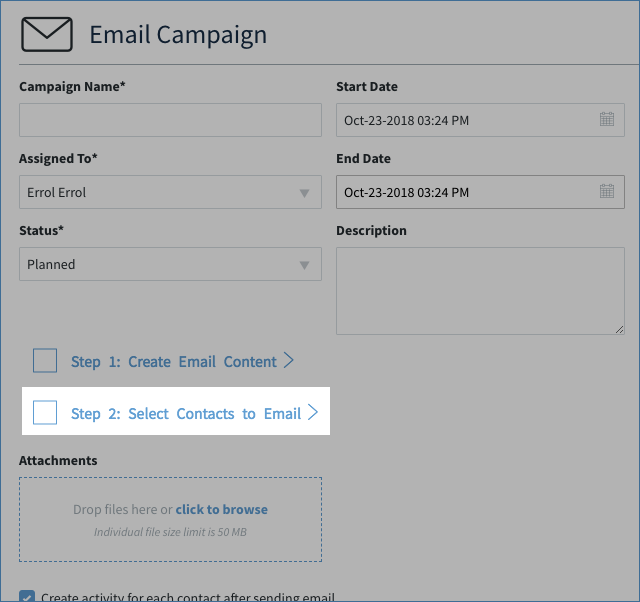 On the Email Campaign screen, click Step 2: Select Contacts to Email. This opens the Select Contacts to Email screen. Filter views: Choose from the list of available filtering options to narrow down your list. Search Bar: Filter the list further by typing in a search term. Checkbox Column: Choose to load specific contacts by checking the checkbox next to their name, or load all of your contacts by clicking Load All at the bottom of the screen. Opt-out Checkboxes: The app does not load contacts if they are marked to opt out of marketing or billing emails. You can still send emails to these contacts by clicking the checkboxes at the bottom of the list, which overrides the contact's settings for this email only. Once you have chosen your contacts, you will hit Load Only Selected (or Load All if you want all the contacts.) A window pops up with information on how many contacts you have chosen and if any errors were detected. Back: You are done with creating the list. Go back to the Email Campaign. Remove All: Removes all contacts from the list and start over. Remove Selected: Select contacts in the grid via the checkbox and click this to remove them. Select More Contacts: Go back to the grid that allows you to add more contacts to the list. 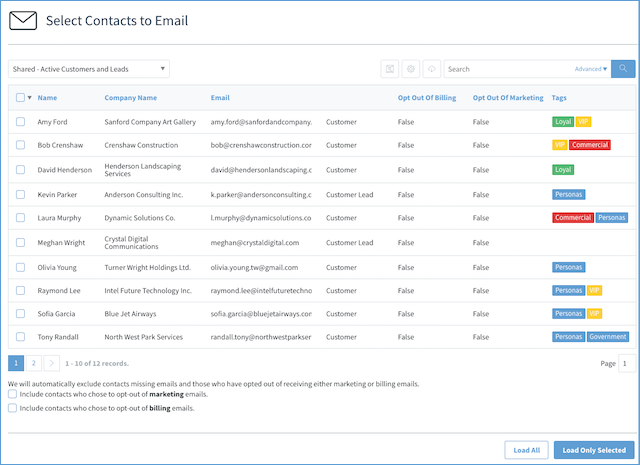 Once your contacts are chosen, you are ready to send your email campaign. If a contact does not have a valid email, they will not be included in the list. The app will load and send emails to duplicate contacts. If you have two contacts with the same email address, that address will receive the email twice. At the moment, there is no way to filter for this, so you must perform a manual check. Now it's time to prepare your final steps before sending the email. Please click here to continue.